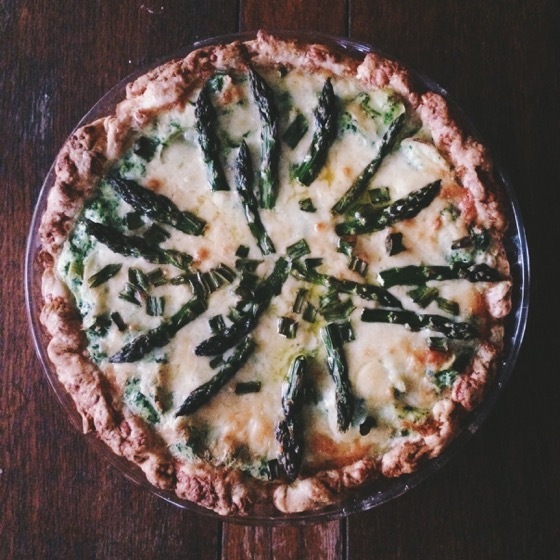 I am such a sucker for the one dish meal that a quiche or pie can be. 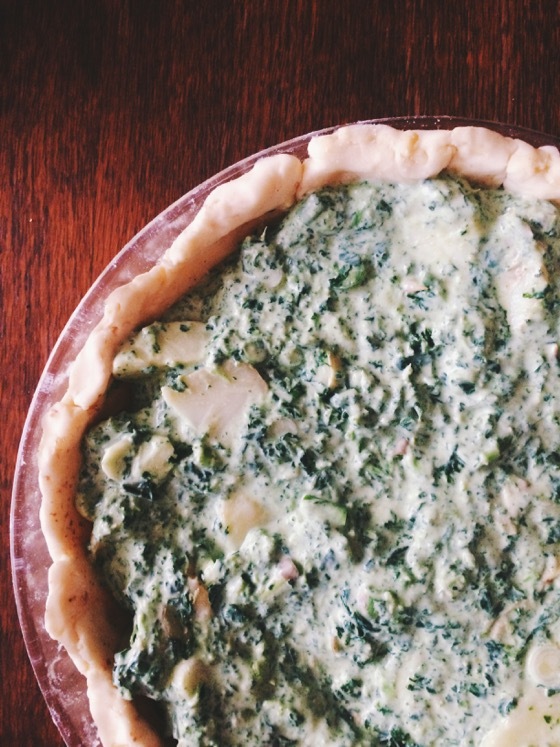 Also I love anything, and I mean anything, that involves pie crust or pastry dough of any kind. 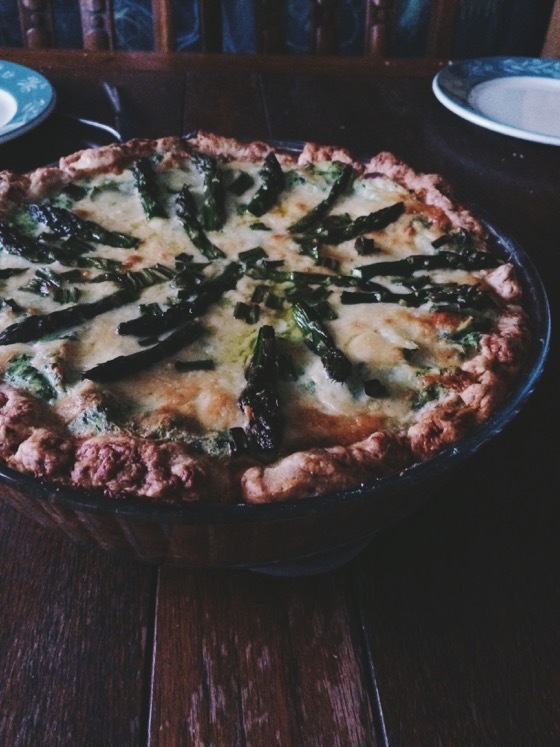 So this asparagus potato ricotta pie called my name as soon as I saw it in my Tesco magazine. On its first appearance on our dinner table, this pie was gobbled up by every member of my family except the youngest. 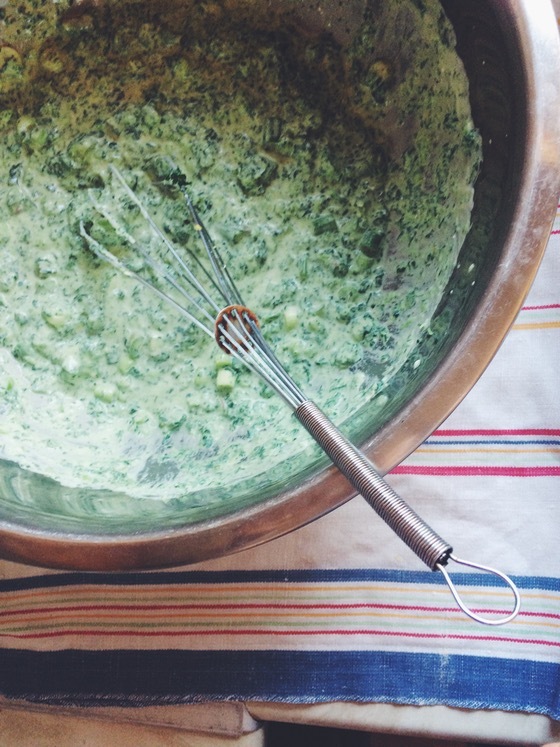 The filling starts as eggs, ricotta, kale and green onions (called spring onions in the UK). 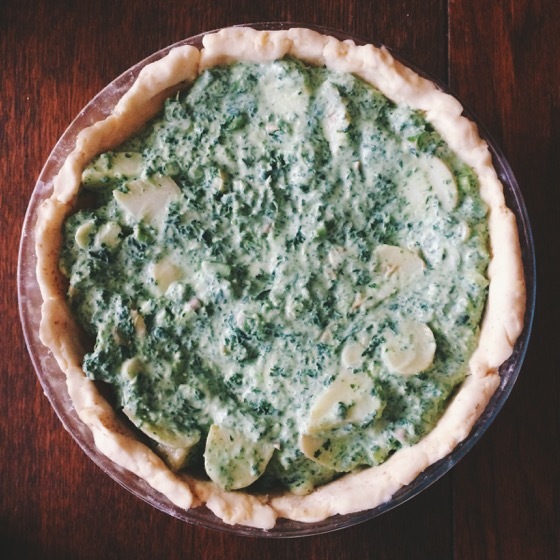 But then you add parboiled, sliced potatoes to the mixture, which makes the whole pie less egg/quiche and more potato/cheese, which is a happy evolution of the traditional quiche for my family. I used a pre-bought crust and mixed shredded cheddar cheese into it with a food processor before rolling it out, so even the crust has a savory, cheesy feel. 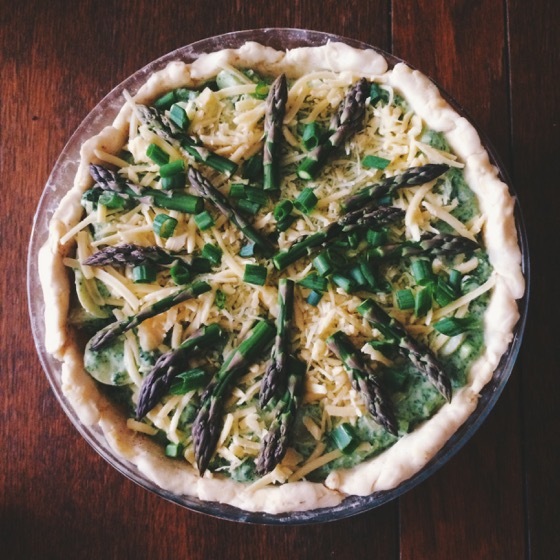 You put the stalks of the asparagus in the pie, but save the tips for the topping. So pretty, right?? We eat vegetarian about five out of seven days of the week, so when I find a meatless dessert that most everyone enjoys, I get super excited! Mix flour and salt. Cut in the butter with a pastry blender. Toss in cheese. Drizzle water while stirring and form into a large disk. Roll out and press into a 9-inch pie plate. Chill while prepping filling. Boil the potatoes in water until just tender. (15 minutes) Drain and leave to cool. In a large boil, whisk together eggs, cream, mustard and ricotta. Season with salt and pepper. Cut the rough 1-2 inches off the asparagus and discard. 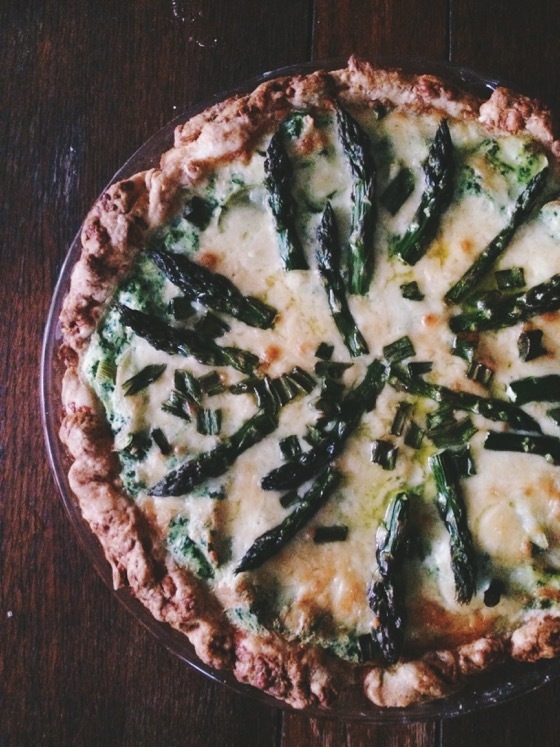 Cut the asparagus tips off and set aside. Chop the remaining stocks into 1/2 inch pieces and toss them into the ricotta egg mixture. Dice the green onions and add them as well, reserving about a tablespoon for the top. Fold in defrosted kale (or spinach). Slice the cooled potatoes and fold in as well. Spread the ground almonds on the base of the pie crust. Pour the filling into the pie crust and press until packed flat. Scatter the 1/2 cup cheese on top. 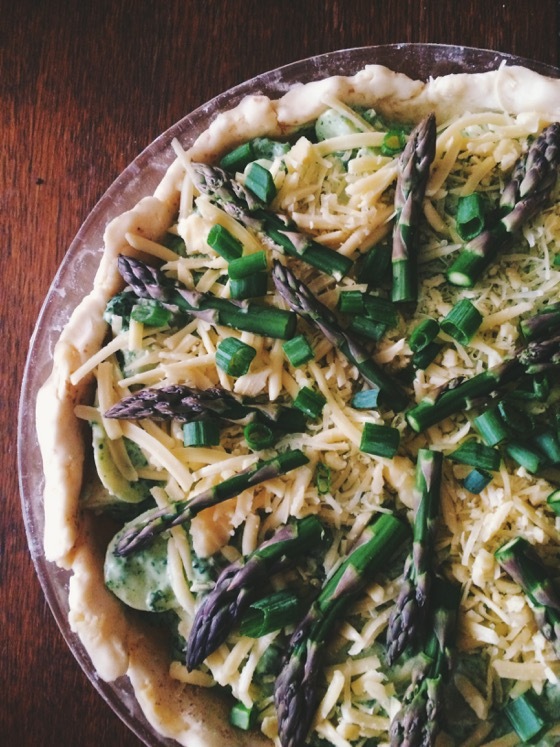 Place the asparagus tips on top and the reserved green onions. Bake in a 400 degrees F oven (180 C or gas mark 4) for 45 minutes, until the filling is set and the pastry is golden. Allow to sit for ten minutes before slicing and serving. Yes, definitely. Looks yummy and so simple and elegant!